Lo Wang is back: The cool ninja must fight again against demons. Compared to the previous game, Shadow Warrior 2 has not changed much. The usual sarcastic humor is not missing and the Ninja Lo Wang proves permanently with witty. In addition to the single-player campaign including story mission there is also a cooperative mode. . If you are looking for an entry into the ninja shooter, we recommend you this beginner’s guide with tips and tricks to Shadow Warrior 2. But before you venture into the ninja adventure, you must first decide on a difficulty level. 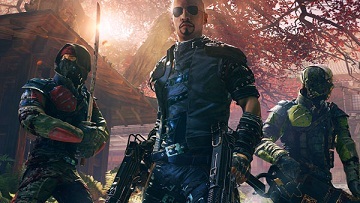 In Shadow Warrior 2, there are 4 difficulty levels: Easy, Normal, Hard and Insane. We recommend you try the normal difficulty level first. Easy: 50 percent less damage from attacks, more healing, ammo and more, as well as a minor punishment after death. This difficulty level is for those who just want to feel just like a superhero after a busy day. Normal: 100% damage, enemies heal after attacks only up to 50%. This difficulty level is for the newcomers to game, and want to explore the world and all mechanisms and still expect some challenges. Hard: (50% more HP, stronger aura and higher magic resistance, more special enemies, less collectable (healing, etc. ), greater penalty after death, normal enemies heal up to 100 percent, Special to 50 percent, BUT there is much better loot. This level is recommended for all veterans of the first-person shooter or those who want more - for a lighter difficulty. Insane: This difficulty level is for those who want to venture or take risks and not be afraid to enter hell. Even SW veterans will have some problems with the Insane difficulty at the beginning. If you are familiar with shooters, you will hardly have problems with the normal difficulty. Here we recommend "difficult". If you want to play in Coop mode right from the start, you must first complete the Prolog mission. After that, 3 friends can join with you. A new feature that we have immediately found favor was the photo mode. If you click on F9, Shadow Warrior 2 will play in slow motion and you can take photos. Especially the slower time is a merciful break in this fast paced game. If you just cannot shoot photos, you see hordes of opponents standing opposite. Use the dash and double jump (2x spacebar). They bring even more speed into the game, but can also save you from danger zones. - Complete demons so you don’t only get karma and skill points but also they drop special loot, such as weapon upgrades. These are found in the form of precious stones. - If you want to distribute Skill points, you have to switch to the main menu and spend the valuable points under Skills. - Find the map to find collectibles and secrets. Those who have played the first part will find special objects that will make you smile. - Headless women statues with lanterns form checkpoints. Once you light the lantern, you have activated the point. - You can find in the game world crates that can loot her. Here you will find ammo, new weapons, money, weapons and armor upgrades in the form of precious stones and much more. You can also destroy objects, such as vases, bottles, or cabinets. Even in strange looking plants hides Loot, like Chi-essence. So shoot or beat on everything that gets in your way. - In addition to the main mission, you should also search NPCs who have side missions for you. - The mini-map also shows everything important in your environment. Question marks stand for missions that you must and can accept, while exclamation marks mark the delivery of a mission. When giving missions, you'll also find nice rewards, such as new weapons. The green plus indicates that there is healing there and a blue bottle that you find there Chi. In addition, crates are displayed, which you can loot (orange crate symbols) and opponents are marked in red. But you can also disable all this. - At the bottom left of the screen you can see two bars. The green is your health bar, while the blue one shows your chi. Chi is similar to mana. You need it to cast spells. At the beginning, you are healing with Chi. Look for shrines that charge you ammo (pink shrine), health (green), and chi (orange, blue). - Always have a look at your surroundings during the fight. Often, you'll find barrels or plants that explode when you shoot at them and can damage your enemies. - If you have enemies surrounded, you should grab the Katana. On the PC, simply press A or D for the desired direction and the right mouse button. - In total, you can take up to 8 guns simultaneously and change this at any time during the fight. Upgrade your weapons and make them stronger. Element upgrades also have the right damage effect for special monsters. You can contribute up to 8 guns simultaneously and change this at any time during the fight. Upgrade your weapons and make them stronger. Element upgrades also have the right damage effect for special monsters.